During the entire time of “Life in the soil”, I kept thinking of the above little animation. Then, I attended Lisa Hirmer’s presentation. “The Law of conservation of mass states that matter can neither be created nor destroyed. It can only be rearranged”. This principle informs her work Pile Dirt. It also evokes the ability of soil to remember, to lose shape and re-constitute elsewhere. We might have all noticed the piles of rabble or the newly formed hills that suddenly appear in proximity of construction sites. If left untouched, they start transforming and soon a layer of soil forms on their surface. They will always stand there (or elsewhere) to remind us that they once were something else. One such example is Toronto’s Leslie Spit, or, as Hirmer defines it, Toronto’s “petrified Urban Vomit”. The Spit is an artificial peninsula in the East end of Toronto that has been literally built out of the rabble from years and years of construction work in the city. Nature has partially re-appropriated the Spit, but it is still possible to find remnants of what used to be buildings, metal sticking out of the ground and other unexpected treasure troves. The Spit is now a park, a party location and a cyclist paradise. Hirmer seems to have a keen interest in the affective aspects of soil and dirt, and has produced a series of public art projects that evoke this aspect. 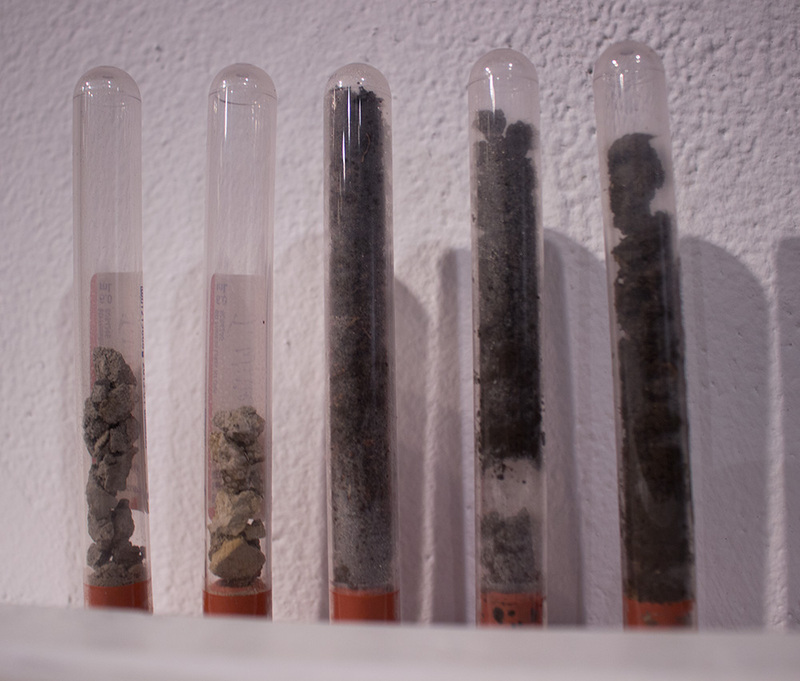 During a residency at the Centre for Contemporary Art and the Natural World at Peninsula Arts in Plymouth, U.K., she worked with local soil scientists on the peatlands, peat bog formations that never decompose but are capable of retaining atmospheric carbon dioxide. In her show, she sought to generate discussions about the meaning, the look and the role of carbon sinks. 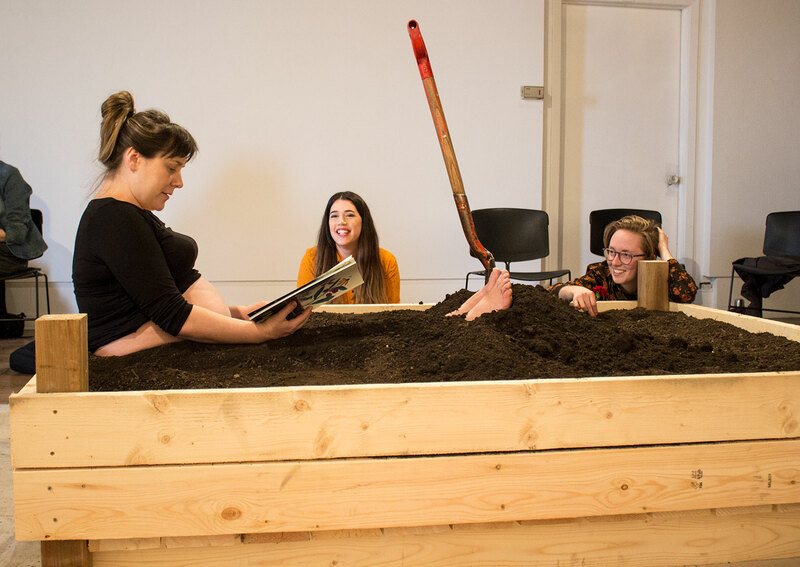 In a third project in collaboration with artists from Australia, she explored the labor and affective value of …digging a hole! The project in fact consisted in “digging a hole and then fill it again”, a silly project by all means, but that catalyzed the interest of many participants who volunteered to dig the hole, and turned the “digging the hole” into a social event. The surprising reaction generated by a gesture as simple as digging a hole makes one wonders what triggers it: is it the memory of a game we used to play in our childhood? Or the socializing that comes with it? Or is it, as the paper mentioned by Amanda White and Alana Bartol, the contact with soil producing extra serotonin? Whether we read this on a scientific paper or it comes form anecdotal experience, soil releases mysterious energies and contact with it produces may produce comfort, may evoke a feeling of being protected. 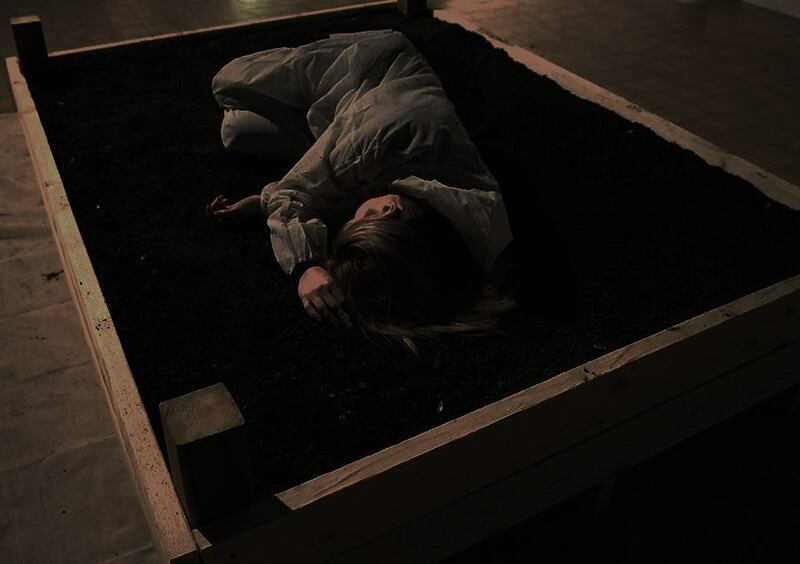 During these three days deep contact occurred in various circumstances, when artist Kacie Auffret treated the bed of soil in the gallery just like a human being, and performed a session of Reiky, Alana Bartol Slept on the soil bed, a rather turbulent sleep disturbed by the 24/7 heavy-truck traffic at the nearby border. Finally, Amanda White decided to dig a hole herself and let her unborn child touch the soil while she was reading him a story about soil. As for the samples that we collected from our various homes/gardens/backyards/contested spaces, part of them joined the soil bed, whose content will be donated for gardening and farming. Each of us took one sample home. It is not certain whether we will return it to where it came from.